Reports, conference papers and book chapters (co-)authored by ICWRGC staff members or (co-) edited by the ICWRGC. This report is part of a series of progress reports under the UN-Water Integrated Monitoring Initiative for SDG 6 that reviews the global progress made towards achieving Sustainable Development Goal 6 (SDG 6) of the 2030 Agenda for Sustainable Development. It was launched by UN Environment during World Water Week 2018 in Stockholm and is based on country data, compiled and verified by the responsible United Nations organisations, and sometimes complemented by data from other sources. The ICWRGC contributed to the report as implementing partner for SDG Indicator 6.3.2 (“Good Ambient Water Quality”) in the framework of the GEMS/Water programme (UN Environment). This report reviews the global progress made towards achieving Sustainable Development Goal 6 (SDG 6) of the 2030 Agenda for Sustainable Development. It builds on the latest data available for the eleven SDG 6 global indicators and was prepared to inform the High-level Political Forum for Sustainable Development during its in-depth review of SDG 6 in July 2018. 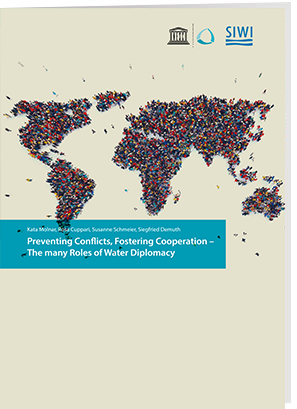 This report deals with the manifold facets and options of water diplomacy, including the linkages between conflict and cooperation. Water diplomacy can be used to promote technical water cooperation, develop good relations among neighbouring countries in transboundary catchments, and thus prevent conflicts, promote economic development and political stability as well as improve environmental conditions. 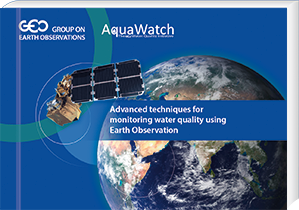 The GEO Water Quality Initiative AquaWatch aims at developing international operational water quality information systems based on Earth Observation with a focus on the developing world. As part of its outreach activities, AquaWatch has compiled a publication with information and examples about water quality issues and available water quality monitoring methods to inform parties involved in water resource management, policy and sustainable development. The ICWRGC is actively contributing to several AquaWatch working groups and has supported the design, production and printing of the booklet. 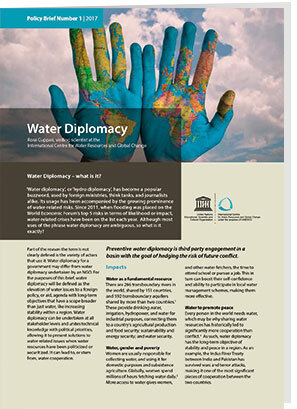 Water Diplomacy – what is it? ‘Water diplomacy’, or ‘hydro diplomacy’, has become a popular buzzword, used by foreign ministries, think tanks, and journalists alike. Its usage has been accompanied by the growing prominence of water-related risks. Since 2011, when flooding was placed on the World Economic Forum’s top 5 risks in terms of likelihood or impact, water-related crises have been on the list each year. Although most uses of the phrase water diplomacy are ambiguous, so what is it exactly? Peer-reviewed journal articles (co)-authored by ICWRGC staff members. is the title of a publication by Dr. Marianela Fader, Colleen Cranmer, Richard Lawford and Jill Engel-Cox. Achieving the SDG targets will require committed efforts by nations and organizations over the coming decade. To determine the best compatible actions within funding, infrastructure development, and implementation of three closely aligned goals, the greatest synergies where investigated as well as conflicting resource needs creating trade-offs possibly threatening SDG success. The SDGs each have several targets that need to be realized to reach the goal. A methodology was designed to analyse each target of SDG 2 (food), 6 (water), and 7 (energy). The targets were compared pairwise and total interaction was calculated to determine different levels of synergies and trade-offs for every pair. It was concluded that achieving the water targets will make it continuously easier to achieve other targets. While the results may require adaptation to a specific locality or country, they provide an improved understanding of the interactions between the targets. The value of the study lies in the quantitative methodology as it can be used as a replicable analysis for any level of work on SDG implementation. Recent accelerated climate change has exacerbated existing environmental problems in the Mediterranean Basin due to a combination of changes in land use, increasing pollution and declining biodiversity. For five broad and interconnected impact domains (water, ecosystems, food, health and security), current change and future scenarios point to significant and increasing risks during the coming decades. Policies for the sustainable development of Mediterranean countries need to mitigate these risks and consider adaptation options, but currently lack adequate information. This is especially true of the most vulnerable southern Mediterranean societies, where fewer systematic observations schemes and impact models are based. A dedicated effort to synthesize existing scientific knowledge across disciplines is underway, aiming at providing a better understanding of the combined risks posed. Achieving the long-term temperature goal of the Paris Agreement requires forest-based mitigation. Collective progress towards this goal will be assessed by the Paris Agreement’s global stocktake. At present, there is a discrepancy of about 4 GtCO2 yr 1 in global anthropogenic net land-use emissions between global models (reflected in IPCC assessment reports) and aggregated national GHG inventories (under the UNFCCC). The authors show that a substantial part of this discrepancy (about 3.2 GtCO2 yr-1) can be explained by conceptual differences in anthropogenic forest sink estimation, related to the representation of environmental change impacts and the areas considered as managed. Published in Nature Climate Change, volume 8, pages 914–920 (2018). is the title of a publication co-authored by Daniel A. Contreras, Alberte Bondeau, Joël Guiot, Alan Kirman, Eneko Hiriart, Loup Bernard, Romain Suarez and Marianela Fader. This paper explores the relationship between past climate and prehistoric Mediterranean agriculture by adapting a process-based dynamic vegetation model to estimate potential agricultural productivity under climate scenarios characterizing the extremes of Mediterranean climate in the Holocene. Quantitative estimates of potential yields are produced under past climatic conditions derived from four Holocene climatic extremes under two different assumptions about the intensity of agricultural practice. This process is discussed with reference to a case study in Provence, examining the methodology and data requirements for modelling past agriculture and considering the implications of the variability in potential agricultural productivity under distinct climate conditions. Special focus is on comparing the range of variability induced by climatic shifts with that achievable through changes in agricultural practices as a means of approaching questions of past vulnerability and resilience. A growing human population and changing consumption patterns threaten adequate food supply globally by increasing pressure on already scarce land and water resources. Various measures have been suggested to sustainably secure future food supply: diet change, food loss reduction and closing the yield gap of nutrients as well as water. In this paper, we carry out a review and integration of these measures to provide a first estimate of the combined potential at country level. The overall potential increase in global food supply was estimated to be 111% and 223% at moderate and high implementation levels, respectively. Further, this analysis highlights country-level management opportunities for each intervention studied. Several potential future research opportunities are proposed to improve integration of measures. 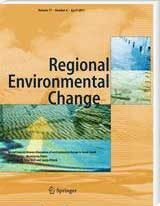 A synthesis of peer-reviewed literature and own modelling work shows that the MENA region is highly affected by present and future climate change. The agricultural sector, seventy percent of which is rain-fed, is highly exposed to changing climatic conditions. This is of critical importance due to the sector’s major contributions to employment rates and national economies. Impacts will be significant in a 2°C world, as e.g. annual water discharge is projected to drop by another 15-45% (75% in a 4°C world) with unusual heat extremes being projected to affect about one-third of the land area. As a consequence, deteriorating rural livelihoods associated with declining agricultural productivity will continue to contribute to migration flows and, likely, to social unrest and political instability. Dominik Kolesch from TUM stayed from 05.03. – 04.09.2018 at the ICWRGC to write his master thesis dealing with “Derivation of a Meta-Indicator for Water Quality by Comparison of Existing Water Quality Indicators and Indices with GEMStat Data”. He successfully completed this thesis in October 2018. The Millennium Ecosystem Assessment has shown that better protection of freshwater biodiversity and the health of aquatic life is imperative. SDG 6.3.2 demands an index to describe water quality in terms of ecological health. This study uses a new approach to a meta indicator for describing riverine water quality, resulting in 3 parameter sets for water quality measuring. The index has been applied in 2 rivers, Rio Tietê (Brazil) and Ebro (Spain). The chosen CCME Water Quality Index (WQI) was tested against existing applications of WQIs in the researched regions. Indexing is an efficient tool of displaying complex data in an aggregated form. The goal of the study was to describe water quality in rivers. The real challenge is to tackle the whole river health. In the future, with some improvements based on the present approach, a new subindex for water quality will be developed and add a more precise piece to the puzzle.